To every architectural challenge Studio Basheva finds a human-centered solution, enhancing every aspect of people’s lives. STUDIO BASHEVA offers a comprehensive planning design services working in all London Boroughs and home counties. We work on vacant land, semi vacant land, conversion and existing building to uplift. We have an extensive experience with listed buildings and conservation areas. At STUDIO BASHEVA we pride our- selves for designing spaces with light. The practice is underpinned by a rigorous process ensuring a tight project delivery with high level precision. We cover all across London & South-East. At STUDIO BASHEVA we offer a complete design to always add value of the land and property. We offer at the stage of initial site visits we can advise on Right of Lights, Party Wall matters, volume of the build ing, extensions, conversions, general refurbishments and the state of the property as it stands. At STUDIO BASHEVA we have an wealth of experience with listed buildings, conservation areas, and densely populated urban fabric. 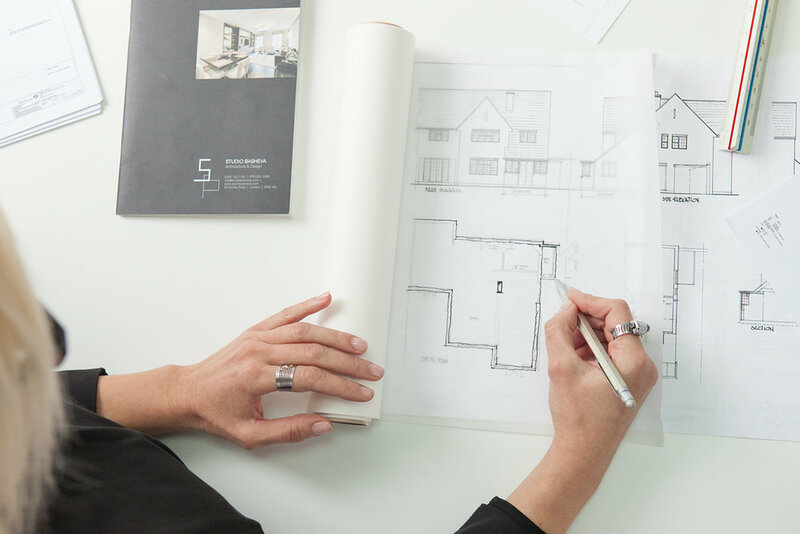 The Studio has extensive experience with the challenge of bringing listed properties up to a contemporary services specification, along with current regulations for new build developments. At STUDIO BASHEVA, we have been working autonomously on a diversified portfolio from the design brief and planning application through tender and full construction phase until the practical completion of the project and the client’s occupation. At STUDIO BASHEVA we offer detailed design working closely with interior designers to achieve a complete look. We work with developers closely to dress properties for sales. Once the brief and design have been agreed on, we will proceed to develop the best options and explore alternatives to meet the client’s brief. At STUDIO BASHEVA we have integrated all the essential disciplines involved in a project under one roof. This provides clients with a single point of contact and ensures the design solutions we offer are better, less costly, and developed sooner. At STUDIO BASHEVA ARCHITECTURE we pride ourselves for designing light spaces, and meeting the clients budgets within the given time frame. We enter into a dynamic dialog with the client to establish the wants and the wishes of the project. We have an extensive experience in a wide range of projects from urban master planning, projects in education, and high-end residential refurbishments.